2 tablespoons dry sherry (not cooking sherry), alcohol will be cooked out. Make sure the leek is cleaned and free from dirt and sand by trimming each end, cutting the leek in half lengthwise, and carefully washing between the layers. Slice the leek in thin slices, both the white and green parts. Combine the leek with onion, vegetable broth, vegetable base, sherry, potatoes and bread. If liquid does not cover vegetables, add a little water. Bring mixture to a boil, reduce heat and cover. Cook soup mixture for 20-30 minutes. Add the balance of the ingredients, mix thoroughly and let soup cool for about 10 minutes. With a hand mixer or food processor, blend soup mixture until very smooth. 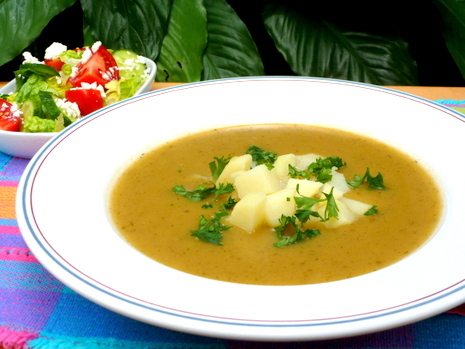 Serve the soup hot and add potato and parsley garnish just before serving.